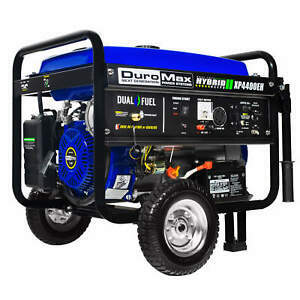 The DuroMax XP4400EH produces 3500 watts and can generate 7.0 horsepower. When this gadget air-cools an environment, the product powers down the motor when the oil is low as a safety feature. The XP4400EH can operate efficiently while using propane or gasoline, and managing energy usage is easy. The unit has a convenient mechanism on the panel that shuts off the engine, as well as multiple power outlets, a volt meter, and a circuit breaker. There are 1,078 items available. Please enter a number less than or equal to 1,078. Arrived a few days later than expected but thats ok. It works so far. Thank you. Good price! Fast shipping! Would do business with again! Assembly was easy and start-up was quick. Instructions were semi-clear, but sufficiently illustrated to make the job easy. Operating on LP, voltage output is steady and clean. Only issue from my perspective is that it is noisier than expected. The advertised noise figure for the "muffler" is probably correct, but the mechanical noise is louder than the exhaust noise, so could be a problem in some campsites. I suspect this will quiet down after some run-time since this is running right out of the box. Will update post later after some actual use. Over all - giving a pleased rating - would be five stars except for the clanging and rattle of the mechanical operating sounds. Pulled it out of the box, then the smell of Chinese Factory hit. Next put on the wheels, handles, put in the oil, hooked it up to a propane tank, turned the key and she fired right up. It's not an inverter genny so it's a screamah' , but works well for the money. I have it as my back up for the Mutant, Zombie, Biker Apocalypse.... can't store gasoline in any large quantity. Propane stores forever. Update: I've been running for a few months now. (It is no longer my back-up). Since I'm off-grid with a solar set-up, living in the interior of Alaska and since the Sun doesn't really shine a lot during Dark Winter, the generator is getting run about 6 hours a day to keep my battery bank topped off. The 240V breaker is pretty sensitive and will trip off with motors requiring surge (like a Fridge) when my battery bank is charging. I've turned down the Battery Charger to about 70 amps DC, but even that causes the breaker to trip more than I would expect. Also consumption is kinda higher than expected. I've only run propane so can't speak to gasoline, but I'm averaging about 0.30 gallons propane an hour. a 100 lb tank filled with about 24 gallons of propane will last between 70 - 75 hours of run time or between 10 - 15 days. Depending on weather and charge rates. Another note, even brand new it consumes Oil. We have to make sure and check the oil everyday and usually have to fill the reservoir about once a week. Overall for the price........ well, you get what you pay for. For a little over $350 u.s. I can't really complain. At that price you an get two or three for same thing made by Yamaha or Honda. Also buy some ear-muffs....... Good lord is she loud!! Seems to be a good generator: Have run the unit 3 times only so here are my thoughts. The oil filler plug/check level is very low to the ground which makes it hard to check properly. The provided funnel makes it easier to add oil but nothing for the checking. The battery disconnected cable is not mentioned in the instructions that I saw, at least on my read anyway. I have only used the unit with propane but so far so good. Seems to crank fairly quickly. It is quite noisy however. Nice looking equipment. Arrived with minor damage to the heat shield (easily fixable with the proper knowledge) and other evidence of rough handling (not during shipping, but possibly while being handled at the factory in China). One of the cage tubes is bent inward about 1/2" , but it doesn't affect the operation of the generator, nor does it affect the mounting of the parts. It is such a gradual bend that it isn't readily apparent to people who have seen it. The battery in my unit came with sufficient charge to start the engine. The unit is noisy. Normal conversation cannot be conducted in close proximity to the generator. There is a long neck funnel provided for filling the crankcase with oil, but it is packed so tightly, that it suffered a longitudinal crack which had to be plastic welded before use. There is conflicting information concerning the amount of oil to be added, but when oil reaches the bottom of the filler hole, it is full, and that seems to be just shy of a quart. I ran mine on propane to break it in, and it runs flawlessly. The handy voltmeter read between 110 volts and 115 volts while at operating speed, and did not require adjustment.